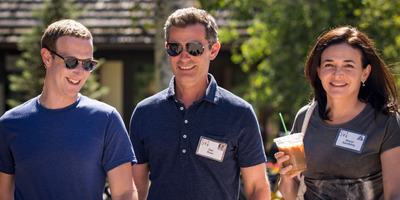 (Photo by Drew Angerer/Getty Images)Facebook executives at the annual Allen & Company Sun Valley Conference in July. Facebook’s user base is declining in Europe, where privacy laws are stricter. Facebook’s privacy chief supports introducing new privacy laws in the US. Facebook’s user base has declined in Europe, the company reported Tuesday on its third-quarter earnings call. 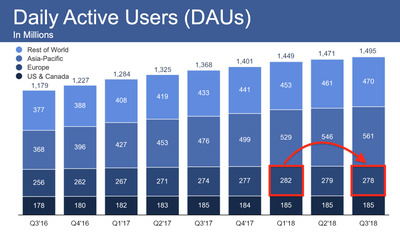 It is the second quarter in a row in which Facebook has lost European users. The two issues have been on Europe’s front pages for months, forcing users to acknowledge how much information they are giving away. Facebook’s response to the GDPR rules required all users to inspect their privacy settings – and the result seems to have been that many users dialed down their engagement with the app. Facebook executives have promised they will follow Europe’s lead on privacy regulation in the US, raising the future prospect of similar declines in North America. The decline in daily active users in Europe, peak to trough, was 1.4%. If a similar decline happened in the US, Facebook would lose about 3.4 million users, based on Tuesday night’s numbers. Facebook stock was up about 5% in premarket trading Wednesday morning, perhaps because declines from GDPR were already priced in. Zuckerberg had warned investors on his first-quarter call to expect declines as a result of GDPR. Historically, Facebook’s stock price has been sensitive to its user-growth numbers. US user growth in the third quarter was flat. 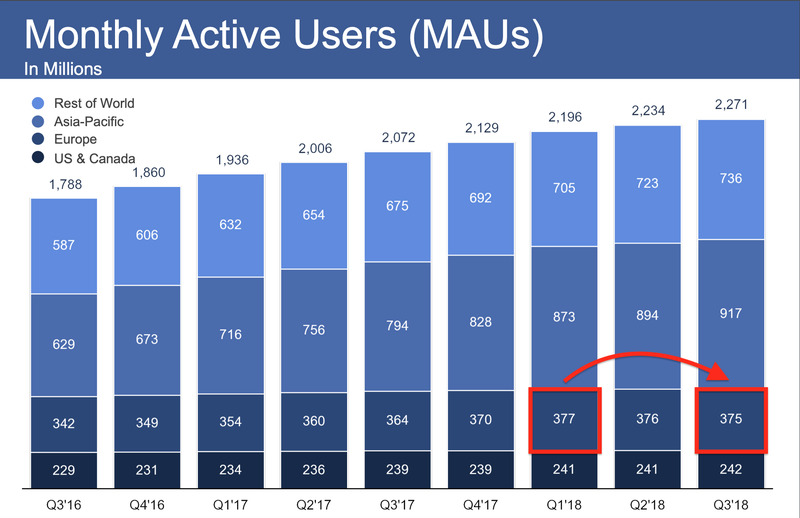 Daily active users dipped by 1 million in the US in the fourth quarter of 2017, the only time that market has shown a sign of weakness.